For the better part of the 19th century, Kent was one of Connecticut’s leading iron-producing towns. These days it is best described as “quaint”. We have driven through the town a couple of times…once stopping at the super expensive Belgique Pâtisserie & Chocolatier mainly because it looked too inviting to drive by. Great collection of liquer filled hand-made chocolates but a tad too tiny to savor. One bite, and they are gone! Minutes from the Chocolate Shop, there is the Kent Falls State Park which is way too crowded during summer and has no entry fee. Also, there are no trash cans inside the park so please “Carry In – Carry Out” to keep the place clean. Recently Yankee Magazine voted Kent #1 of the “Top 25 Foliage Towns in New England”. Yes, in all of New England! 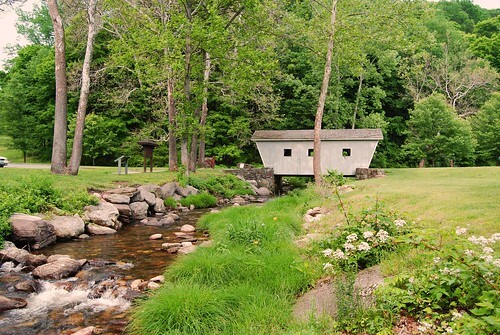 Kent managed to beat the Mohawk trail and the scenic byways of New Hampshire. Talk about surprises! Litchfield County, which is home to the town of Kent is pretty amazing with all its quintessential New England features like covered bridges and antique dives but whether it deserves the top spot for fall foliage remains to be seen. Congratuations on your historic first entry. I can tell this will be a popular blog.